Finally, the “living stones” of the Church took to the streets of Paris to remind us that the Church is more that just stones but is Christ’s Mystical Body on Earth. It was deeply moving to see the crowds kneeling in prayer in the shadow of Notre-Dame singing the Ave Maria. Why were their tears in the eyes of so many Parisians? Were they crying simply over damage done to a building of grand art and architecture? Or were they crying over something more? Perhaps it was over the lost Catholic identity of their nation symbolized in the flames engulfing Notre-Dame. Through the intercession of the Mother of God, may this tragedy remind us of Notre-Dame’s true purpose. And may we see this wonder restored along with Faith that built it. Lancaster, England, Jun 8, 2017 / 02:58 pm (CNA/EWTN News).- The Bishop of Lancaster issued last week liturgical norms for the Neocatechumenal Way, which apply to all in the diocese, in the interest of “fostering clarity” around the celebration of the Eucharist. “The Neocatechumenal Way has been active in our Diocese for many years and has been a blessing to many people,” Bishop Michael Campbell, OSA, wrote in a May 28 statement issuing the norms. “Recent years have seen a growing sense of unease about the multiplication of small community Masses in some of our already quite small parishes and about some of the differences in the way the Mass is celebrated among the communities of the Neocatechumenal Way,” he added. The movement must celebrate Mass at a consecrated altar and members of the congregation who receive the Blessed Sacrament must consume it as soon as they receive it, Bishop Campell directed. The Neocatechumenal Way is an ecclesial movement that focuses on post-baptismal adult formation in small parish-based groups. It was founded in 1963 by Spanish painter Kiko Arguello. Today it is estimated that the movement has about 1 million members, in some 40,000 parish-based communities around the world. “Here, I exercise my authority to establish norms regarding the regulation of the liturgy, as a way of fostering clarity concerning the celebration of the Eucharist,” the bishop wrote. In the statement, five liturgical norms were reiterated for the Lancaster diocese. The second norm stipulated that if the Neocatechumenal Way’s Mass is one of a parish’s regularly scheduled Masses, its special character be noted in the bulletin; if the Mass is in addition to a regularly scheduled Mass on Saturday evening, a portion of its collection should go to the parish. The third norm stated that the pastor has the authority to direct how many additional Masses may be said. In order to allow for the time it may take to rearrage Mass schedules such that all are said at a consecrated altar, the fourth norm said this condition takes effect on July 1. The fifth norm concerned the reception of Communion. Bishop Campbell directed that, in accord with the General Instruction of the Roman Missal, the celebrant of a Mass must consume the Body and Blood of Christ prior to distributing Communion, and that communicants are to consume the Body and Blood as soon as they receive the host or chalice. “There is to be no delay,” the bishop emphasized. 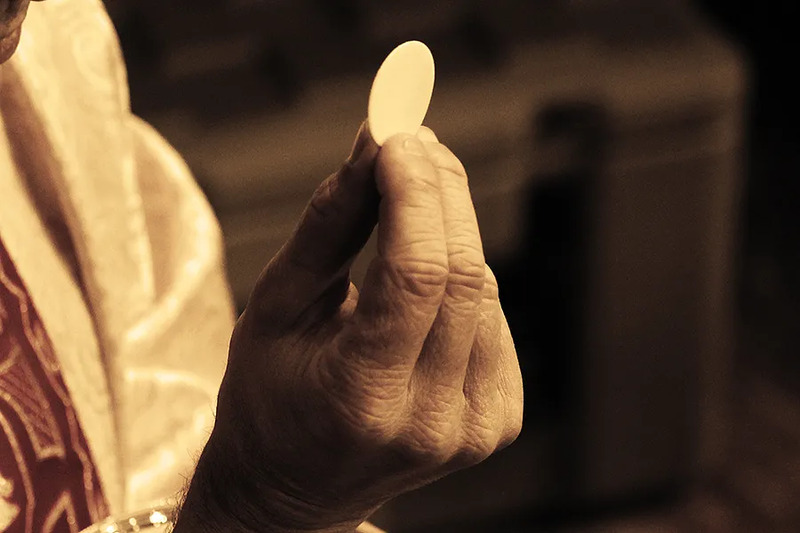 Neocatechumenal Way Masses typically direct that communicants hold the Eucharist in their hand and consume the Body of Christ only after everyone has been given a Host. Bishop Campell’s liturgical norms mirror those issued in March for the Archdiocese of Agaña. Since the Neocatechumenal Way was founded, the group has sometimes been cautioned by the Vatican for inserting various novel practices into the Masses it organizes. These include practices such as lay preaching, the reception of Holy Communion while sitting, and the passing of the Most Precious Blood from person to person. Sorry to hear this happened. Hoping for a full recovery. 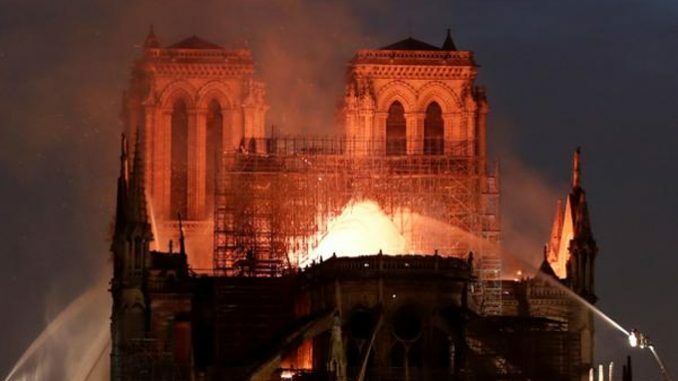 Yesterday as we watched the flames engulf the beautiful cathedral of Notre Dame we were encouraged to see so many in prayer and in tears as they sang the Ave Maria – the Hail Mary, a powerful prayer. Many from all over the world joined them in prayer. If this tragedy has brought some, maybe many, back to prayer and to God, then it is a good thing, and a sign hope rising from the ashes. For all of us, not just the people of France and of Paris in particular. It is unlikely that Macron committed to rebuild the Cathedral for “the glory of Jesus Christ and His Mother.” The church is French government property and attracts millions of tourists, only an indeterminate (but undoubtedly small) percentage of whom have any interest in the place’s real purpose. I would like to be proven wrong, of course. Another reason for hope is the coming of age of bright, talented, orthodox young priests like Fr Sean. May his tribe increase!